* Sixthly To direct that (as the Diggers and other residents on the Gold Fields of the Colony have uniformly developed a love of law and order) the sending of an Armed Force to enforce the License Tax be discontinued. And your Petitioners as in duty bound will ever pray etc. Once thought to be lost, the Bendigo Goldfields Petition was discovered by chance lying in a pile of papers on a rubbish tip. Some 13 metres in length and bound in green silk, it’s a milestone document in the state’s history. The petition was signed by over 5000 diggers on the Victorian goldfields in mid-1853. At the time, the signatures represented about one in 12 diggers. In June 1853 an anti-gold licence association was formed at Bendigo to give voice to the diggers' many grievances about their conditions. The diggers were angry about the mining licence fees imposed by the government and the system by which they were collected. The petition was signed by miners across the state’s major goldfields and was brought to Melbourne and presented to Lieutenant-Governor Charles La Trobe on 01 August 1853. Most of its demands, including the reduction in the licence fee, were rejected. 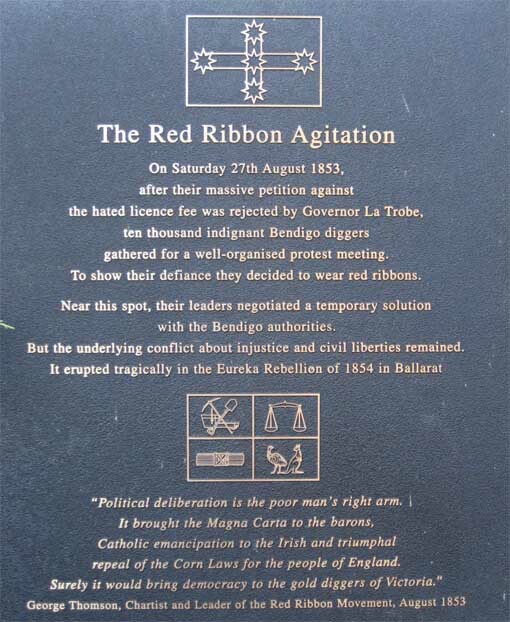 Eventually the diggers' dissatisfaction erupted, culminating in the Eureka Stockade uprising at Ballarat on 3 December 1854. Two women signed the petition - Florence Foley and Sarah Williamson. Dr John Chapman, a Melbourne collector, purchased the petition from its discoverer and presented it to the State Library of Victoria in 1988. Its discovery is particularly valuable for historians and genealogists investigating the history of social and political events during the gold rushes in Victoria. ↑ http://www.slv.vic.gov.au/our-collections/treasures-curios/bendigo-goldfields-petition, accessed 06 December 2013. This page was last edited on 17 April 2019, at 11:37.